Okay, let’s face it. 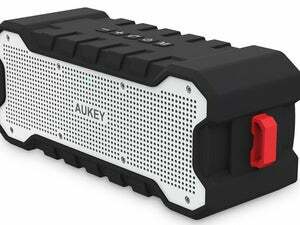 The facade of the average Bluetooth speaker, while perhaps not ugly, doesn’t shout “Class!” Words such as fun, interesting, and unique often apply, but until I got my first look at the Aukey SK-S1, sophisticated was not an adjective that had ever popped into my head. Just to reinforce that thought, I jumped immediately to Prokofiev’s Classical Symphony rather than Toto’s “Africa”, AC/DC’s “Thunderstruck,” or subsonic dance tunes for my first listening test. Good news: Even though this speaker was priced at just $33 on Amazon at the time of this review, it sounded great with each of those tracks—at least when played at low volume levels. I was generally impressed by the last Aukey speaker I reviewed, the $50, rugged SK-M12, but it wasn’t the looker this one is. 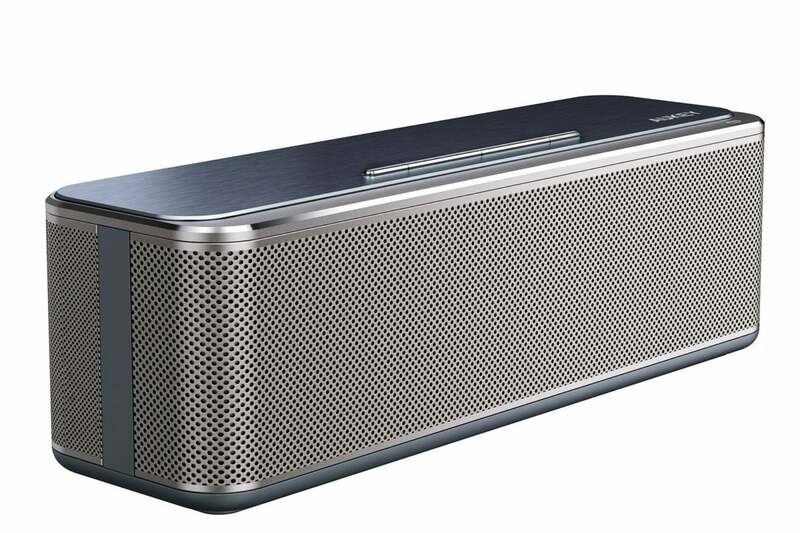 The 7.9-inch-wide, 2.4-inch-deep, 2.6-inch-high SK-S1 has a two-tone pewter/dark gray trim finish with silver trim, and it looks good from just about any angle, with a minor caveat I’ll discuss in the “sound” section, below. I’ve never seen anything that looks more at home in the workplace, though there is a bit of a clock-radio vibe to it (minus the clock display). I liked the slim sliver-on-silver buttons on top, though the fit was just a bit off on the volume up/down and next/previous track buttons, with one end slightly higher than the other. That’s about the only sign that this is a budget speaker, not a $100 or $150 one. 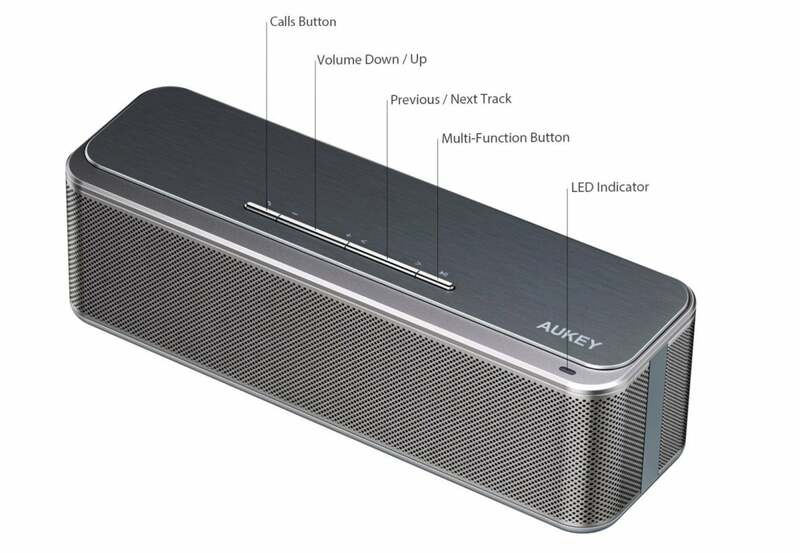 The Aukey SK-S1 isn’t large, but it does produce a nicely tuned sonic image at low volume. The other two buttons on top of the unit serve to answer the phone and play/pause music. There’s a tiny dedicated power button, a micro-USB input for charging, and a 3.5mm auxiliary audio input on the back. There’s no Type A USB port for charging other devices, but given the speaker’s desktop mission, I don’t see that as a shrotcoming. I was impressed with the SK-S1’s sound at don’t-disturb-others levels. It’s amazing what you can do with high mids and treble when you’re not worried about water incursion. This speaker is made to sit on your desk and be played quietly, not taken into the pool or backpacking. That said, if you’re just looking for quiet tunes while staring at nature, I got about 10 hours of run time out of the unit. 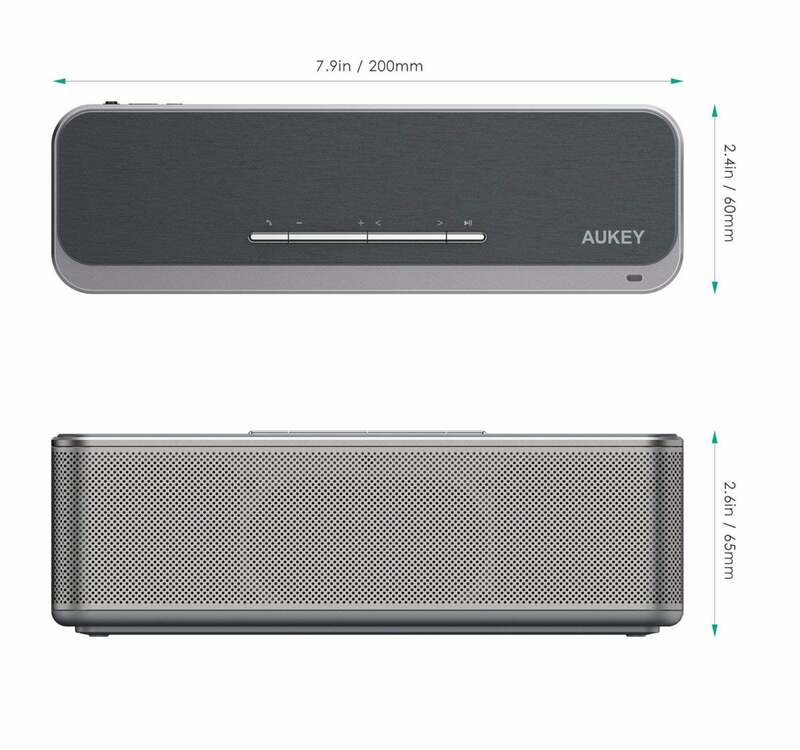 In addition to very clear sound (the aforementioned high mids and treble), Aukey also manages to pull a fair bit of stereo separation out of the SK-S1. The twin speakers fire forward and slightly to the sides, and lower frequencies are also passively radiated to the rear, so placement is important. You can also play games with other objects to reflect the sound and create even more of a sense of separation. There’s an acceptable amount of bass. By that I mean you can hear the kick drum and bass, but you won’t feel them. Still, I think the overall image is very well balanced at lower sound levels. The SK-S1 looks better in person. It also sounds best on its back. Yes, on its back. Which brings me to a confession—also, a tip: I liked the sound of the SK-S1 best when it was lying on its back, not its bottom. This kind of spoils its look from your vantage point, as you’ll be staring at an upside-down logo or a big sticker with certification logos. But this orientation disperses sound nicely, mitigates the transient highs that the SK-S1 falls ever so slightly prey to, and couples the bass better with the surface it’s sitting on. Tastes will vary, but give it a try. I keep harping on the low-volume thing for a reason: The 16-watt SK-S1 is not a loud or thumpy speaker. When you start to crank it, the upper mid-range rapidly becomes harsh and quickly overwhelms the decidedly moderate amount of bass. This speaker is made for listening at low volume while you work, read, or contemplate the state of the universe. It's not the right choice to fill a room with sound or to anchor a party. I really like the SK-S1. Most speakers I test go back in the box the minute I’m finished with them—this one stayed out on the desk for a prolonged visit. It’s still there and I’m listening to Copeland’s Rodeo on it while I finish this article. If a handsome speaker for low-volume listening is what you seek, this one is nigh on perfect. For anything else, look elsewhere.